Jesus’ treasure was hidden in an earthen vessel. He was the son of God made into human flesh. He was despised and rejected of men. He opened the eyes of the blind, healed the lame, opened up the ears of the deaf, stilled a raging storm and walked on water. Yet, he was accused of blasphemy and put to death by the political and religious leaders of his day. The political and religious authorities thought his execution would shut up his message of repentance from sin and his soon coming kingdom of righteousness. They thought the execution of John the Baptist would shut up his message as well. The truth of his message of repentance from sin and dead works and the saving of our souls is confirmed by his resurrection. Jesus’ followers continue to proclaim his message of repentance and salvation in his name. Jesus’ followers continue to defy the hatred and threats against them. They continue to boldly proclaim his kingdom of righteousness will come and be established on the earth. Faith in Jesus’ resurrection and deity still transforms hearts and lives every day. For every one of us who love Jesus Christ, there are many more who despise the message of his resurrection from the dead. The message of Jesus coming kingdom of righteousness still causes those who are bound in chains of sin and living in darkness to curse his name and to hate his followers. They despise the message of repentance from sin. They hate the light because they do not want their evil ways to be exposed. But their threats and efforts to destroy the message of hope in the cross and the righteousness it stands for will be short lived. With each passing day those in this generation who despise Jesus Christ are coming closer to the edge of an eternal abyss. Once they pass through life to death, they will fall into this dark abyss where they will no longer be given an opportunity to repent from their dark deeds. For those who reject the message of the cross, those who are blind to the truth, they day of reckoning with their creator is fast approaching. Their time to live in wickedness and sin is running out. Jesus came to seek came to seek and save that which was lost. He came to seek the lost people who would kill and condemn him. He preached about a coming kingdom. He sacrificed himself so that others would be able to receive salvation. He prayed for those who killed him on the cross. He said “Father forgive them for they do not know what they are doing.” He loved those who hated him. If the devil and his evil demons would have been able to see the future and understand the far reaching consequences of his resurrection from the dead—they never would have crucified him—but they did. The political and religious leaders who wanted to shut him up and kill him failed miserably. The message of Jesus Christ and repentance from sin continues to go forth throughout all the earth. His message will not be stopped. Every attempt to silence the truth about the coming kingdom of righteousness will fail. Jesus is returning soon. Those who hate him and his followers will see him coming in power and glory. They will try to hide their faces from his majesty, but there will be no place to hide. Those who sin with impunity today will no longer be able to get away with their rebellion against God and his kingdom of righteousness. All that is wrong will be made right. His reign of justice will yield an everlasting peace. People in darkness are calling their evil deeds good. They are calling Christians and those who follow God evil. Their days are numbered. They will disappear into the darkness. The sounds of their senseless hatred against the lamb and his followers will cease from the earth. The message of light, faith, hope, love and joy will be soon heard among the nations. Their message will soon be replaced with one of joy and peace during the reign of the one they loved to hate. Every knee will bow to him and every tongue will confess he is Lord of all! The treasure that was in Jesus earthen vessel was multiplied through those who believe in his name. Those who believe in his name continue to carry his treasure within themselves. This treasure is not corruptible like gold and silver, it is an incorruptible treasure. When you follow Jesus and your name is considered evil and your deeds are considered wicked–when your good deeds are despised – rejoice–you are in good company. The treasure in your earthen vessel cannot be defeated. The treasure in Jesus earthen vessel overcame sin, sickness, poverty and death. Your treasure in your earthen vessel is made of the same stuff as Jesus – you cannot be defeated by sickness, poverty and death. You will be an overcomer. You will see his kingdom come and his will be done! You are an overcomer. Rejoice for your name is written in heaven. Greater is he that is in your than he that is in the world! Holiness will triumph over ungodliness! Jesus had his treasure in an earthen vessel. You can have this treasure, too! If you do not have Jesus Christ in your heart, you can easily fix this. Jesus Christ can give you a new heart, and he will come and live within your heart. He will be live with you and the presence of the Holy Spirit in your heart will comfort you. He will be your best friend! The Holy Spirit living in your heart is your treasure. The miracle of new life and the presence of God living in you will give you peace, hope and the wisdom to live right and show you how to enjoy life! Read this message below if you do not have this treasure within you. If you already have this message within you, you can be salt and light in the earth by downloading this message and giving it to a friend or an enemy who needs this treasure in their earthen vessel! The ABCs of How to be Saved! If you enjoyed reading this article, you might also enjoy reading one of my Kindle eBooks available on Amazon.com. Click on the link to see a Kindle eBook preview to look inside each book. 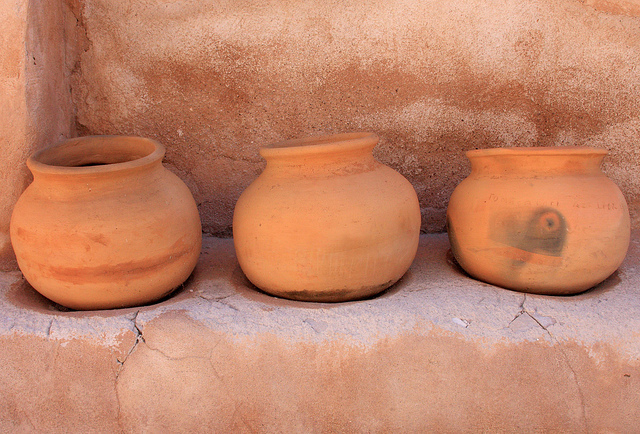 Three Clay Pots Photo – Creative Commons 2.0 License.